Backflow prevention systems are a must for any commercial building with large sinks, photo developing equipment, dishwashers or other machines where contaminated water is prone to backflow. Backflow prevention, sometimes known as a cross-connection control device, keeps contaminated or polluted water separate from drinking water. It is important for fire prevention systems because any water used in fighting a fire or commercial fire sprinkler systems should be potable. Like any water safety system, there are also building codes that require installation of backflow prevention devices and there are specific types of backflow prevention devices that are required by code. The backflow prevention system is necessary when water is kept at high pressures to enable water flow. If the pressure fails due to an emergency (such as a broken pipe), undesirable solids, liquids, or gases may be sucked into the clean water supply. 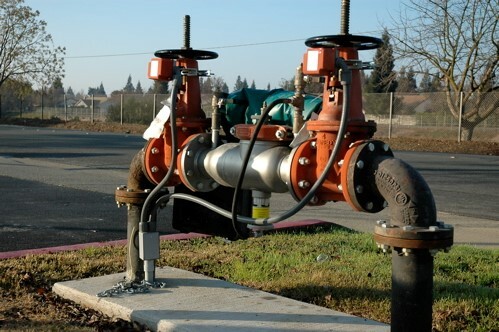 Backflow prevention devices use an air gap, or an assembly of valves or pressure vacuums to regulate cross-connection of drinking and contaminated water systems. When drinking water and contaminated water systems meet in certain intersections of piping, the clean water must move into the contaminated water, not the other way around. If the system fails, contaminated water can backflow into clean water as the contaminated water moves to an area of lower pressure. Just as the suction of a straw directs liquid to its proper destination, so the prevention backflow system is needed to prevent cross contamination. Since backflow prevention is an emergency system, inspection is required on a regular basis. Without regular inspection and installation, a faulty system could endanger the lives of people who drink water connected to the systems. In the past, a lack of working backflow prevention has even led to contamination of entire towns! The installation, inspection and certification of backflow prevention systems should always be handled by professionals who are experienced with such systems. If you have questions regarding your backflow prevention system, contact Total Fire & Safety for more information.